I came across a new chart today, and found the relationship between source of input for decision-making and the resulting usefulness and trust they found in the content – people tend to trust content at approximately half the rate that they find it useful. Point #1 – Consumers trust AND value the usefulness of information gleaned through conversation with friends, families and co-workers (peers) at an exceedingly high level around the globe. I suppose the only interesting point here is that the observation is global in its’ nature. Point #2 – Those same consumers trust comments and blogs less. Core social content is seen as less valid in decision-making. In fact, comments are trusted and found useful at about half the rate as personal relationships, and blogs at half of that. Point #3 – Not just that, but they tend to trust the content half as much as they find it useful. THis is probably the more interesting stat… seen from a different dimension, people consciously use the latter two sources of content at twice the rate that they find it trustworthy. This doesn’t seem sustainable. It seems to beg for a new solution… consumers around the globe appear open for new social solutions to amass decision-making content. This entry was posted on Monday, July 19th, 2010 at 6:05 pm and is filed under Social Media Marketing, Strategy, Thoughts. You can follow any responses to this entry through the RSS 2.0 feed. You can leave a response, or trackback from your own site. 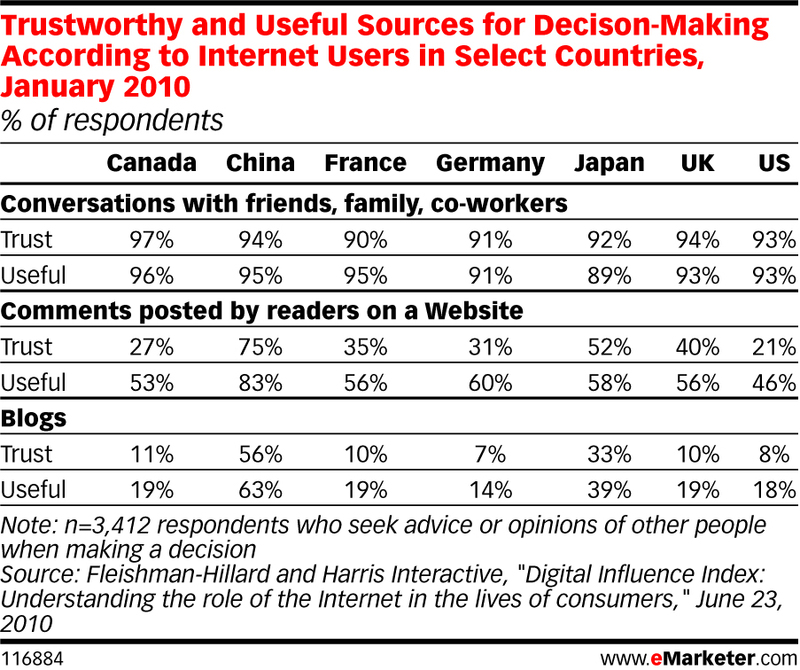 Interesting to note that China and Japan have noticeably higher trust and usefulness rates for comments and blogs. I’m not sure about China/Japan, but South Korea requires internet users to validate their internet identity with their SSN. As a result, the blogs and social media in SK suffers from much less noise and spam compared to the United States. Great post. One thing that caught my eye was the higher percentage under Comments and Blogs for China. Why do you think their percentage average is higher than other regions? Perhaps due to more digital media restrictions and fewer available media resources? And perhaps if they are in fact restricted to fewer online resources, the few that they see are perceived to be more dependable.